Inflatable Boat Classified Ads - Inflatable Boat Accessories, Inflatable Boat Information and more..... all in one great location! for inflatable boats. No gLued parts or hassles. How to find that slow leak? Find the answer here and other FAQs. Only $50 annually for a text ad, or $100 annually for a photo ad. Click to order your $50 text ad, then email us your ad content here. View and place free private ads here. Up to 45% off now, on select custom products View all Products? 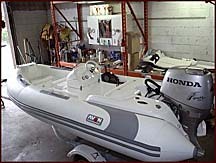 Wide variety of inflatable boats, kayak, canoes for all applications. Starting from 1 person and going up to 15' - 8 person boats. Special deals. Click here to learn more. RIBCRAFT now offers the exact same performance, durability, and safety, military & marine professionals have come to expect from them, to recreational boaters with the RIBCRAFT line of rigid inflatable boats. The ultimate yacht tender! This fully rigged 11'9' rigid hull Hypalon boat has all the bells and whistles including telescoping stern light, battery lock out switch, pop-up cleats, bilge pump, tach, speedo, trim gauge, built in fuel tank and many more. This boat will do over 40 mph with it's clean and quiet 40 hp. Honda. Comes complete with a galvanized trailer. Package retails for over $23,000. Price $18,500 Cdn. $12,335 U.S. This is a �state of the art� 6m Search and Rescue boat that features 2 of Zodiac�s new technologies: The patented Durarib� foam collar and the Ullman Jockey extreme duty seat� are installed on this standard Zodiac Hurricane 633 RIB. Powered by a 200hp Mariner outboard mounted on an aluminum transom bracket the boat achieves speeds of up to 45 knots. Steering and controls are provided by a twist grip handlebar system for extreme weather control. Hotribs.com, is a great UK based website specifically for RIBs. Put your business ad here for as low as $50. Order now or email us for more info. Custom products available for inflatable boats including davit systems, propeller safety guards, outboard engine stabilizer fins, seats, engine mounting brackets and much more. Visit our page at now. 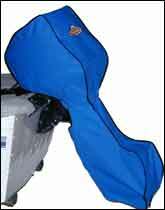 Inflatable boat and marine products available online including small inflatable boats, oars, foot pumps, ski tubes, fun water sports toys, trailer accessories and much, much more. Visit our page at now. List your name, location, contact number, an email link, and up to 50 words of text to describe the product or service you're trying to sell or buy. Add a photo for only $50 more. Your ad stays on for 1 year. Visit our services page to order your classified ad now!